The 3200 Series LPZ conveyor is an ideal solution for taking product out of a machine at low elevations and transporting it to a more ergonomic height for operators. Recently, Dorner worked with a customer who was packaging delicate product using a vertical bagger. However, the packaging varied from 6” tall to 12” tall. The challenge was that a fixed height differential used to accommodate larger packages would pose issues with product damage for the smaller packages. Dorner found a solution using an adjustable angle LPZ that the user could adjust with a jack screw based on the product being run. Having the adjustable angle LPZ reduces the risk of damage to the product as the drop distance was the same for the smaller and larger packages. In addition to the adjustable angle design, Dorner used a modular belt conveyor with friction inserts to carry the product up the gradual incline. Also, the SmartSlot frame construction reduces the possibility of resting dust/debris collecting in an open T-Slot in the customers’ dust-filled environment. Other features of the turnkey solution includes an adjustable in-feed chute to guide the product on the conveyor, two air knifes to gently push the product over after it landed vertically on the conveyor (see video below), a motorized pulley drive that saves space around the drive tail, and sensors and controls for indexing or continued operation. For more information on Dorner’s 3200 Modular Belt LPZ conveyors be sure to check out the product page. 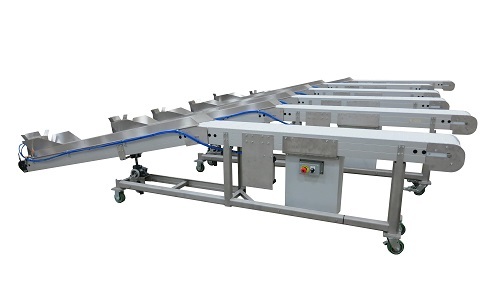 Also, see our newly launched 2200 LPZ Conveyors.